“Disaster displacement represents one of the biggest humanitarian challenges of the 21st century,” said Walter Kaelin of the Nansen Initiative, at a convention of the intergovernmental consultative process on environmental migration led by Norway and Switzerland ahead of COP21 in October. Between 2008 and 2014, 184.6 million people were forced from their homes due to floods, earthquakes, tropical storms, volcanic eruptions, and other natural disasters, with 19.3 million newly displaced in 2014, according to the latest available data from the Internal Displacement Monitoring Centre (IDMC). The driving force of such migration can be broken down into two types of natural dangers: rapid-onset trigger events and slow-onset emergencies. While extreme-weather events (e.g. earthquakes or floods) cause a direct and urgent movement of people, slower-onset climate change such as drought and erosion are becoming more frequent and persistent. Even as natural disasters have immediate displacement effects and can disrupt established migration patterns, climate-related emergencies—combined with a host of socioeconomic factors—are driving ever greater numbers to migrate internally and across borders. Though often interlinked, as incremental climate change can increase the risk of certain natural disasters, their onset and consequences have widely varying implications for regional migration and international policymaking. The 7.8 magnitude earthquake that struck Nepal in April had direct and immediate effects on the country’s labor migration patterns. The worst disaster in Nepal since 1934, the earthquake, and subsequent powerful tremors in May, claimed more than 8,500 lives and left at least 2 million people homeless. Before the quake, Nepal had been in the midst of a labor exportation surge mainly to India and the Gulf Cooperation Council (GCC) countries—by far the largest driving force in Nepalese migration. Nepal’s economy relies heavily on worker remittances, which accounted for 30 percent of gross domestic product (GDP) or about US $4 billion in 2013-14. With more than 2.2 million foreign-labor permits issued by Nepal between 2008 and 2014, about 8 percent of the country’s population was overseas at the time of the quake. Since the disaster, internal migration and displacement have spiked, with hundreds of thousands of people displaced around the country. International migration has seen a mixed pattern, with some workers returning, desperate to get home to find and support displaced loved ones, while others with no home to return to and facing difficult logistics or employers unwilling to offer leave time, have remained overseas. Though the government facilitated provisions for overseas workers to return home after the quake, the opportunity was largely underused, in part because some families determined that migrant’s earnings were more important. Furthermore, many families in Nepal have since sought to send a worker abroad to increase remittance income to provide necessities in the aftermath of the quake. Slow-onset climate concerns such as drought, rising seas, and erosion affect migration patterns in a more indirect way. Severe drought, alongside complex socioeconomic and political factors, has been a growing motivation for migration in parts of Africa and Central America, with implications for regional migration patterns. In 2015, Angola, Botswana, Malawi, Namibia, South Africa, and Zimbabwe experienced extreme droughts with large impacts on both staple foods and cash crops, which will leave many with decreased means of sustenance or income, and may motivate migration to urban areas or across borders. Botswana in 2015 allocated emergency funds to support livestock farmers in response to the worst drought conditions in 30 years, with agricultural land badly hit by the lack of water; Southern Africa’s total production forecast was down about 7 percent from 2014, according to the UN Food and Agriculture Organization’s 2015 Crop Prospects and Food Situation report. With below-average rainfall and similar crop outcomes predicted into 2016, the undermining of rural livelihoods in farming and herding, and increased competition for resources, may contribute to migration decisions. Long-term climate-related emergencies have significant impacts on employment opportunities, economic sustainability, and perhaps most importantly, food security. Drought in 2015 played a large role in exacerbating food insecurity in sub-Saharan Africa—already plagued by numerous development challenges—to an unprecedented degree. In Malawi alone, 2.8 million people are estimated at risk of food insecurity between October 2015 and March 2016 as a result of drought and flooding. In Somalia, consecutive years of drought and famine have aggravated forced displacement sparked by protracted violent conflict, with 855,000 people facing crisis due to unreliable food availability through December, according to the Assessment Capacities Project. In Central America, food shortages, loss of farming jobs, and worsening hunger caused by prolonged droughts are contributing to migration decisions for poor families alongside high levels of insecurity caused by crime and gang violence, according to a joint World Food Program/International Organization for Migration study. Three and a half million people in El Salvador, Guatemala, and Honduras have been affected by one of the most severe droughts in the region’s history, contributing to increasing migration within Central America and to the United States and Mexico. Migration patterns affected by climate-related phenomenon tend to change gradually. People move in smaller or less frequent waves, depending on how acute the crisis becomes or what their means allow, making such migration harder to track. International organizations and policymakers have begun to recognize the growing challenges—and potential protection obligations—of climate-related migration. On October 13, 110 countries participating in the Nansen Initiative’s final global consultation ahead of COP21 in Paris adopted a nonbinding contract to protect those displaced by earthquakes, volcanoes, and other climate-related hazards. Few disagree that the international community must react and provide aid to those displaced in the event of a natural disaster, but questions remain regarding the movement of people due to slower-onset climate change. In Syria, for example, a five-year drought may have contributed to increasing ethnic tensions and the onset of the civil war, giving rise to a contentious debate on the role of such climate-change effects on refugee flows. With environmental concerns increasingly linked to migration, finding policy answers may assume more prominence on the international migration agenda in the years ahead. Assessment Capacities Project (ACAPS). 2015. Global Emergency Overview Snapshot 14 - 20 October 2015. Geneva: ACAPS. Available Online. De Melo, Jaime. 2015. Climate change and the growing challenges of migration. Planet Policy, August 24, 2015. Available Online. Domínguez, Gabriel. 2015. Nepal quake likely to trigger greater migration. Deutsche Welle, May 6, 2015. Available Online. Food and Agriculture Organization of the United Nations (FAO). 2015. Crop Prospects and Food Situation, No. 3, October 2015. Rome: FAO Trade and Markets Division. Available Online. Internal Displacement Monitoring Centre (IDMC). 2015. Global Estimate 2015: People Displaced by Disasters. Geneva: IDMC. Available Online. Nepal Ministry of Labour and Employment. 2014. Labour Migration for Employment: A Status Report for Nepal: 2013/2014. Kathmandu: Ministry of Labour and Employment. Available Online. Rowling, Megan. 2015. States to boost international protection for people fleeing disasters. Thomson Reuters Foundation, October 15, 2015. Available Online. Siegfried, Kristy. 2015. COP21: Paris climate summit – Is migration the elephant in the room? IRIN News, November 26, 2015. Available Online. Sijapati, Bandita. 2015. 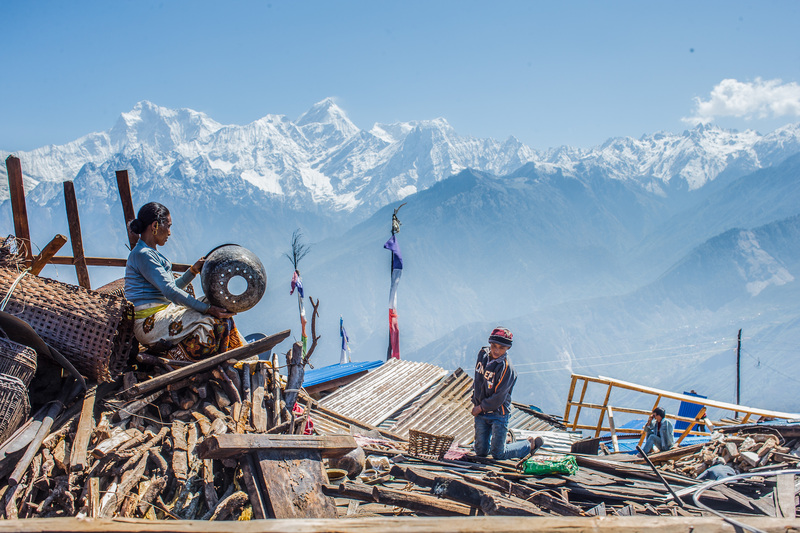 Migration and Resilience: Experiences from Nepal’s 2015 Earthquake. Kathmandu: Centre for the Study of Labour and Mobility. Available Online. The Indian Express. 2015. Timeline: Nepal 2015 to 1934, the worst quake disasters in the last 80 years. The Indian Express, April 27, 2015. Available Online. The Nansen Initiative. 2015. More than 100 governments affirm broad support to better protect people displaced across borders by disasters and the effects of climate change. Press release, October 14, 2015. Available Online. The White House. 2015. Remarks by President Obama at the First Session of COP21, Paris, France, November 30, 2015. Available Online. United Nations Office for the Coordination of Humanitarian Affairs (OCHA). 2015. Drought in Central America in 2015. Panama City: OCHA Regional Office for Latin America and the Caribbean. Available Online. Werz, Michael and Max Hoffman. 2015. Cause behind African migrant flood has terrifying implications for the world. Reuters, April 21, 2015. Available Online. World Food Program (WFP) and International Organization for Migration (IOM). 2015. Hunger Without Borders: The Hidden Links Between Food Insecurity, Violence and Migration in the Northern Triangle of Central America. Panama City: WFP and IOM. Available Online. Liz Heimann was a Communications Coordinator at the Migration Policy Institute.